Lawmaker says haredi parties will likely form unified bloc with United Right party to counter-balance Yisrael Beytenu's coalition demands. Haredi lawmakers will likely form a united front with the Jewish Home and National Union during coalition talks with the Likud, in the hopes of creating a counter-balance to the demands of Yisrael Beytenu, MK Moshe Gafni (United Torah Judaism) said in an interview published by the haredi daily Yated Neeman on Monday. 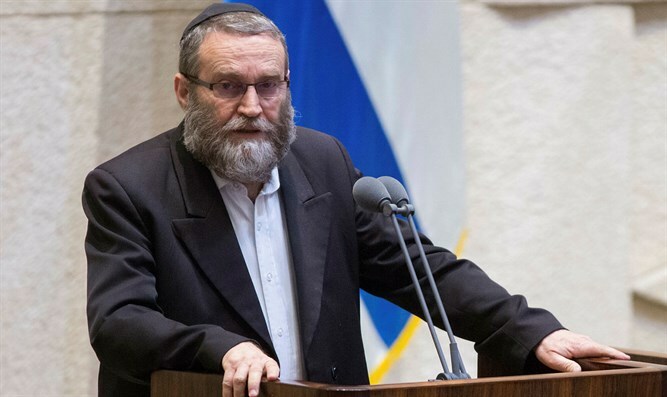 According to Gafni, who chairs the powerful Knesset Finance Committee and is the chairman of the Degel Hatorah faction within the UTJ party, the haredi factions will endorse Netanyahu’s bid for the premiership. At the same time, however, haredi lawmakers will work together with national-religious MKs from the Union of Right-Wing Parties – a joint ticket of Jewish Home and National Union – to push coalition negotiations on issues of religion and state to the right. The joint effort between the religious parties is aimed at curbing Yisrael Beytenu’s bargaining power. Former Defense Minister Avidgor Liberman, Yisrael Beytenu’s chairman, is expected to demand he return as Defense Minister, along with a series of demands on issues of religion and state, including passage of a bill he backed which would encourage haredi enlistment in the IDF. With Yisrael Beytenu currently projected to receive five seats in the next Knesset, Liberman is likely to emerge as kingmaker. Without his faction, the Likud will be unable to reach the necessary 61 seats to form a government. The right-wing – religious bloc, including Yisrael Beytenu, is projected to receive 65 seats. Haredi lawmakers are hoping the formation of a religious bloc will blunt Liberman’s negotiating power. Gafni suggested that if it does not, there may be no path to a 61-MK majority. In the Yated Neeman interview, Gafni added that the religious alliance to counter-balance Liberman could also include the Union of Right-Wing Parties, led by former IDF Chief Rabbi Rafael Peretz.